For this exercise, we need an itinerary. So let’s say you would like to fly between Dubai (DXB) and Kochi (COK), round trip, outbound on Wed, 22 June and inbound on Wed, 29 June. Tip 1: Consider traveling on weekdays instead of weekends (Thu-Sat) if you are in the Middle East. Ticket fares on weekdays are way cheaper than weekend travel. Tip 2: If you are flying solo or if you are not in a rush to reach your destination, consider connecting flights over non-stop flights. Usually, flying direct and non-stop costs more than flying via another destination. The exception to this rule is if you have a low-cost carrier operating on your selected route. Step 1: Investigate if a low-cost airline or budget airline is flying your desired route. Typically, low-cost carriers or budget airlines are cheaper than full-service airlines, especially if you book your ticket at least 3 months before your departure. Sometimes, up to 3 weeks before your departure. However, you will find budget airline fares at par with full-service airlines as you get very close to your journey dates. Sometimes, you might even find seats on budget airlines sold out. You get more options if you are willing to take connecting flights. You can get cheaper deals if you are willing to do the above. You get to check out both non-stop as well as connecting itineraries in a single window. You can experience multiple airlines and layovers especially if you are a travel freak like me. You can unearth last minute deals on certain routes if you are lucky. You will always get a good idea of the price range you need to pay that you can use to make an informed travel decision. Travel websites give you the unmatched ability to compare between itineraries on the basis of multiple parameters such as fares, total journey time, number of connecting flights, arrival time, departing time etc. which you won’t gain by visiting a single airline website. 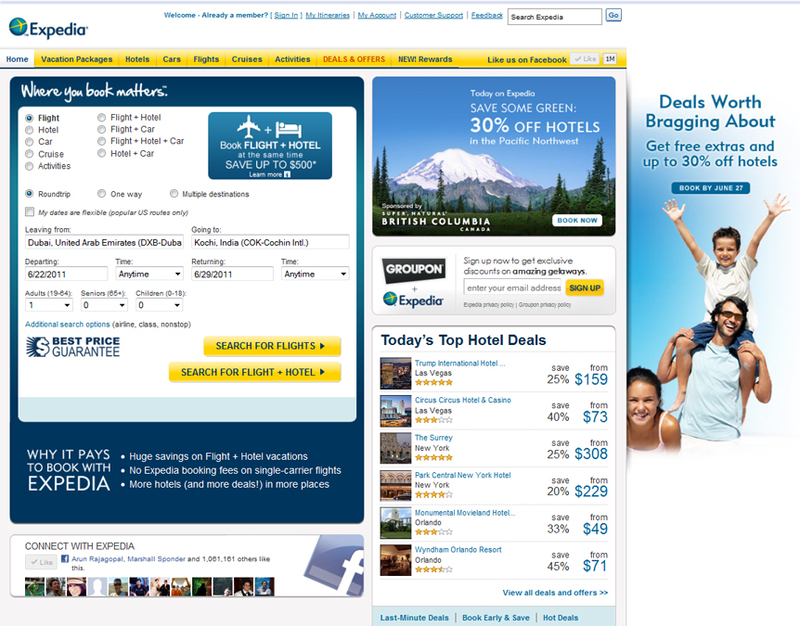 My three most recommended travel websites are Kayak.com, Expedia.com and Cleartrip.ae. You can never go wrong with them. Step 4: Run the search on Kayak.com – entering all the details like destinations and dates and Kayak shows you that best fare is $110 on Bahrain Air. Unbelievable, ha? But there’s a catch – the outbound flight is 16hrs long because of a long layover in Bahrain while the inbound flight is 6hrs30mins. The next best deal is Gulf Air with $409 with 6 hrs of travel time each on both inbound and outbound legs. I wouldn’t recommend the long itinerary on Bahrain Air unless you are that price conscious! Step 5: Run the same search on Cleartrip.ae – Cleartrip is quick to tell me that my best option is again Gulf Air with AED 1,553 ($422.7). Cleartrip is also sharp in telling me that I have an option of flying non-stop on Air India Express on the same route with the fare coming up to AED 1,563 ($425.5). 3 Dollars more and I get to save 2 hours because I fly non-stop, and my decision is made. Air India Express, it will be. However, Cleartrip has a special cash back offer if I use a VISA credit card to book my ticket. In this itinerary, I get a discount of AED 75 ($20.4) bringing my final fare on Air India Express to AED 1488 ($405.1). Step 6: Run the same search on Expedia.com – Expedia tells me my best fare is again the Gulf Air deal that Cleartrip.ae recommended. 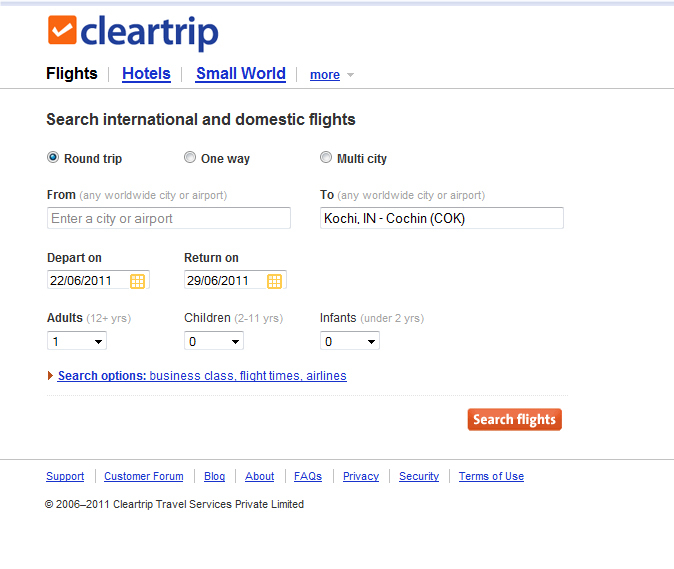 But, they are giving me a price of $409 instead of Cleartrip’s $422.7. Expedia does not list Air India Express on its itineraries. 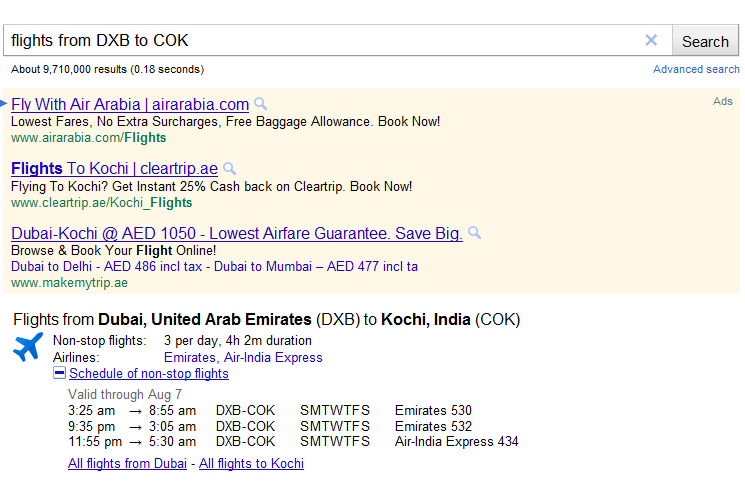 However, Expedia shows me another result, another connecting flight option on Kingfisher Airlines, costing $417. What if you wanted to fly on Kingfisher? Just out of curiosity I looked at the same Kingfisher deal over at Cleartrip. There it costs AED 1799 which is $489.7 – $62 more than Expedia. If you apply the Cleartrip Visa offer deal, the fare comes to AED 1724 ($469.3), still $42 more than what Expedia is offering. See how intriguing this gets with same deals on different websites throwing up different prices. This is why comparison is important. Step 7: Now run the same search on Gulf Air.com & AirIndiaExpress.in (this is just a value-added search to see the fare difference between the airline website and the travel website). You will be surprised sometimes at what you get out of this search. So here are the prices for our final consideration, following Steps 5, 6 and 7. So if you wish to fly non-stop, the clear winner is Cleartrip.ae, if you have a VISA credit card. This fare is cheaper than the airline website itself which is such a great steal. Had you gone straight to the airline, you would have ended up paying $9.3 more. I made the searches between 5pm and 6pm (GMT +4) on Fri, 10 Jun. The pricing dynamics are always fluctuating, but stick to this approach of smart online searching and you should still get better travel deals. Also, try being flexible with your travel dates. Had I decided to make my date of inbound travel as Tuesday, 28 June instead of Wednesday, 29 June, I would have saved AED 70 ($19) with Gulf Air. Also, note that this is work in beta and I’ll be adding more tips in the future. 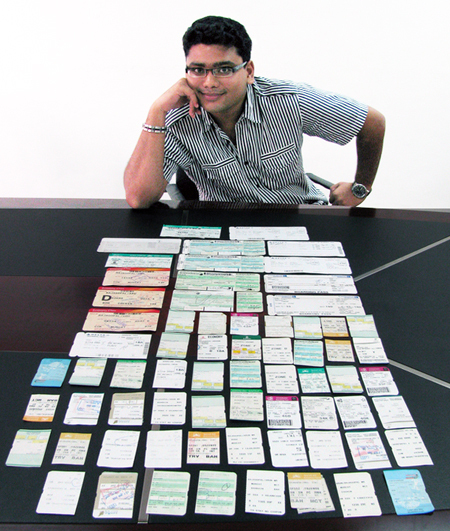 Identify key budget airlines & full-service airlines on your route. 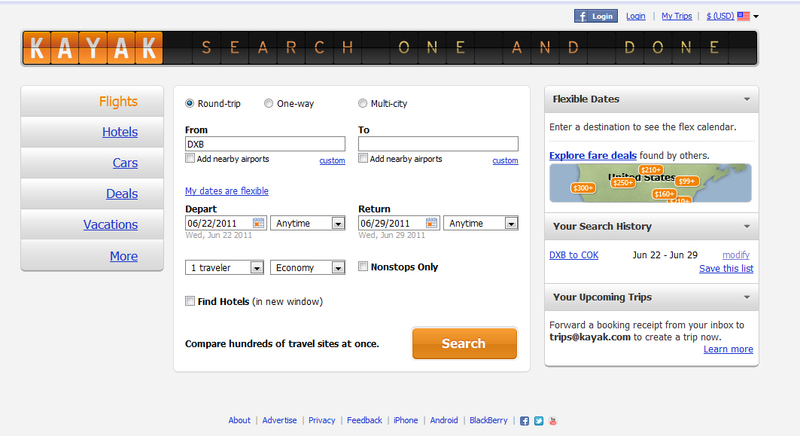 Run searches on Kayak, Expedia and Cleartrip. Watch out for special offers. Cross-check and confirm on the respective airline website. See where you save more. Make your decision. Happy flying! This post was brought to you by eezeer, another cool online travel tool I’m excited about. Eezeer is a new web and mobile social network that features tweets and location-verified reviews related to travel. How eezeer works is interesting. By gathering thousands of tweets and through members’ travel reviews via a mobile app, eezeer quantifies reliable opinions to create an overall picture of how a particular travel brand is viewed in the public eye through social media. This quantity is called “Karma”. By checking out the reputation score and reviews of airlines, hotels and airports you can make informed travel decisions. eezeer currently moderates tweets from 391 airlines, 692 hotels, 152 airports and has verified 291154 users from twitter. For more information on eezeer, click here. The one thing I don’t like about Kayak and several other aggregators is that they cover such a small portion of the market… they’re slow and their fares are not up to date! After all, it’s good searching for prices, but then jump directly to the airlines in order to book. What is the meaning of AED?